As one of the largest ski resorts in California, Mammoth Mountain Ski Resort spans more than 3,500 acres of territory near the Inyo National Forest. Located along the northern side of Mammoth Mountain in the Sierra Mountain range, this ski resort is less than an hour’s drive from Yosemite National Park. Although it is well known for skiing and snowboarding, there are actually a host of activities available that draw visitors in year round. During the summer, the Adventure Center provides activities including rock climbing, a bungee trampoline and zip line. Mountain biking is also popular, and the resort offers a practice loop and skills development area for riders so that they can perfect their technique. The Scenic Star Golf Course also provides spectacular views from each one of its 18 holes. Situated 8,000 feet above sea level, this course provides intriguing play for athletes of all skill levels. Special training programs are available for children, as season passes can be purchased at the resort as well. That’ s not all you can enjoy during the summer, as horseback riding, fishing and hiking are all popular activities here as well. After taking in some strenuous outdoor recreation, kick back and enjoy a hearty meal at one of the many restaurants here before heading to back home for a restful night’s sleep. During the winter, you can take in activities ranging from snowmobiling, snow tubing, cross-45 country skiing and snowboarding. The resort receives as much as 400 inches of snowfall each year, making it ideal for visiting anywhere from November to June. It is also home to a super duper pipe, a 22-foot high, 550-foot long stunt tube that attracts professional athletes for training purposes. There are only a handful of these stunt pipes found anywhere in the world. You don't have to forego skiing or snowboarding due to lack of experience. Mammoth Mountain has more than 400 seasonal instructors that can provide you with private lessons that are tailored for your exact skill level. These lessons can be taken with up to five friends who share your same level of expertise, and are scheduled every hour throughout the day for your convenience. They can be as long or short as you'd like, and range from one to six hours in duration. A scenic gondola ride is also especially breathtaking in winter. Climb aboard a lift and ascend to the summit of Mammoth Mountain, which is a whopping 11,053 feet above sea level. Here you’ll find the Sierra Interpretive Center, where you can learn about the mountain’s history and geology and take some breathtaking photographs. Grab a bite to eat at the Top of the Sierra Market, where you’ll enjoy everything from fresh salads to hearty soups. When you invest in Mammoth Lakes real estate, you’ll always be close to all the amenities Mammoth Mountain has to offer. 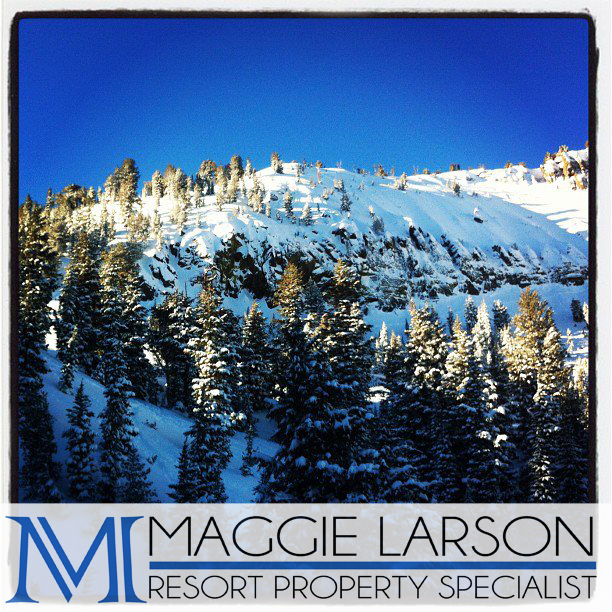 To see some available homes, contact Maggie Larson at Sierra Resort Real Estate. She knows the area well, and can match you with the home of your dreams. Please feel free to stop by and “like” her Facebook page as well.